Madrid's 18th century hospital was beautifully remodelled and converted into a museum in 1992, with two panoramic glass lifts standing out in the façade. In 2005 it added an extension designed by French architect Jean Nouvel. Its official name is the Museo Nacional Centro de Arte Reina Sofía. Many of its art works were transferred from the nearby Prado, and it's now a treasure-house of contemporary and modern art. Two of the floors are devoted to temporary exhibits, while the other two are for the permanent collection which also covers Abstract, Pop, and Minimal Art movements. The highlight is the 20th century's most famous painting, Picasso's "Guernica". It was commissioned by the Spanish government for a Paris exhibition as a Civil War protest and hung in a New York gallery until 1981, fulfilling Picasso's wish that it should not be shown in Spain until democracy was established. It was then exhibited at the Prado, and moved to this permanent home in 1992. Besides "Guernica", another highlight is "Woman in Blue" also by Picasso. Miró and Dali are two other influential artists well represented in the collection, with Miró's enigmatic "Portrait II" being another standout in the museum for its Surrealist elements. Salvador Dali's "Landscapes at Cadaqués" is the artists' showpiece here, painted in the summer of 1923 during his visit to the town of Cadaqués. Also be sure to not miss José Solana's "The Gathering at the Café del Pombo", depicting a gathering of intellectuals at a Madrid café. Also of note are works by international artists such as Francis Bacon's "Reclining Figure", and a serene sculpture by Henry Moore. A library specializing in 20th century art and archives is also part of the museum, with over 10,000 volumes and approximately 1,000 periodicals. The museum shop sells design goods, pottery, and writing materials, and is open during museum hours, while the adjoining restaurant is open late into the night and serves dinners. This area, close to the Atocha train station, is a good location as a base for your stay in Madrid, since it is right alongside the top three museums and within walking distance of all major sights and attractions. There are plenty of hotels, self-catering apartments, and small, family-run hostels within 1Km of the Reina Sofia museum. - visitors must leave all galleries 15 minutes before closing time. - Museum closed on Tuesdays, 1st & 6th January, 1st & 15th May, 9th September, 24th, 25th & 31st December. 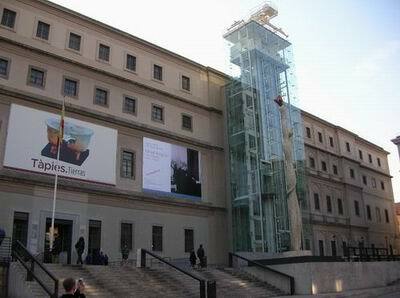 - Free with the MadridCard for this museum, the Prado and many more! Click for more info. - General entrance fee: 6 euros. Please see our tourist map for the location of the Reina Sofia Museum. And don't miss our other Madrid museums here. GoMadrid strives to maintain these details about the Reina Sofia Museum up to date, but takes no responsibility or liability for erroneous information. We recommend you check all relevant conditions with the museum.